Goal: Advancing towards more intuitive methods for creating 3D shapes in motion and their organization into complex virtual worlds. Methodology: Control to the user, Knowledge to the models! 2012-2017: ERC Advanced Grant EXPRESSIVE: EXPloring RESponsive Shapes for Interactive Virtual Environnements. From May 2017: creation of the STREAM Team, LIX, Ecole Polytechnique: STructure Representation and Extraction for computer Animation and geometric Modeling. 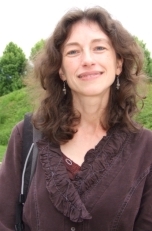 Marie-Paule Cani is a Professor of Computer Science at Ecole Polytechnique (from May 2017), on leave from Grenoble-INP & Inria. Her research interests cover both Shape Modelling and Computer Animation. She contributed over the years to a number of high level models for shapes and motion such as implicit surfaces, multi-resolution physically-based animation and hybrid representations for real-time natural scenes. Following a long lasting interest for virtual sculpture, she has been recently searching for more efficient ways to create 3D content such as combining sketch-based interfaces with procedural models expressing a priori knowledge. She received the Eurographics outstanding technical contributions award in 2011 and a Silver medal from CNRS in 2012 for this work. She was awarded an ERC advanced grant in 2011 and elected at the Academia Europaea in 2013. Marie-Paule Cani is the Technical Paper Chair of SIGGRAPH 2017. Before that, she served in the program committees of all major conferences in Computer Graphics and was program chair a number of times. She served in the steering committees of SCA, SBIM and SMI, and in the editorial board of Graphical Models, IEEE TVCG, Computer Graphics Forum, and is now associate editor of ACM Transactions of Graphics (TOG). She was an EC member of ACM SIGGRAPH from 2007 to 2011, and she represented Computer Graphics in the ACM Publication Board from 2011 to 2014. In France, she belongs to the executive board of the GDR IG-RV (Informatique Géométrique et Graphique, Réalité Virtuelle et Visualisation) and to the CA of the French chapter of Eurographics. After serving as Vice President of Eurographics from 2013, she became President of Eurographics in 2017. Creation and scientific lead of Imagine, joint team INRIA / LJK lab, from 2011 to march 2016. Creation and scientific lead of Evasion, joint team INRIA / GRAVIR lab, 2003-2010. Co-director of GRAVIR (~200 researchers), CNRS, INRIA, UJF and INPG, 2003-2007. Editorial board of ACM Transactions on Graphics since 2013. (Past editorial boards: Computer Graphics Forum 2009-2012, IEEE Transactions on Visualization & Computer Graphics 2005-2008, Graphical Model 2000-2005).